Free Shipping On Orders over $300.00 restrictions may apply. 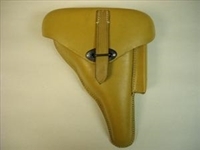 Magazine for the Walther P 38 p1 pistol 9m/m para. Post war but will fit the WWII pistol. Like new condition. "Northridge International has been very helpful with locating rare parts to keep my collection in pristine condition. Keep up the good work!" © 2014 Northridge International Inc.. All Rights Reserved.